Sometimes diligent searching through used books pays off. I came into the possession of a set of books that I never thought I would have for a fraction of what they normally sell for. 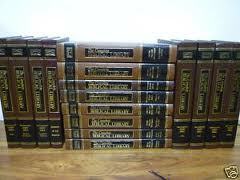 I got the complete set of the volumes that make up the Hebrew and Greek dictionaries of The Complete Biblical Library. They are beautiful hardback volumes of faux leather with gold gilt lettering .There are 22 volumes of the Old Testament portion (blue volumes). Volumes 1-15 cover the books of the Old Testament while Volumes 16-22 (the part I got) is a detailed Hebrew Dictionary with its own numbering system. There is a Hebrew spelling, a phonetic spelling, a listing of the part of speech, a simple definition, a listing of cognates and synonyms, a concordance of every Old Testament usage, and then more careful explanation such as you might find in a theological dictionary. This is followed by word or page number references to several other works including Strong’s.The New Testament ( brown volumes) is similarly set up. There are 16 volumes with volumes 1-9 covering the books of the NT and Volume 10 being a Harmony of the Gospels while Volumes 10-17 (the part I got) being a Greek Dictionary and the last volume a Greek Grammar with helpful indexes for the dictionary. That last volume has an index to give Strong’s numbers to correspond with their numbers. For some reason the index for Hebrew words is here instead of in the OT set. My only complaint is that the indexes would be more helpful the other way around. I use Strong’s numbering system and wish I could look down a list of Strong’s numbers to find this set’s corresponding number. I hope I don’t have to make my own! For some reason these books published by World Library Press in Springfield, Missouri are out of print and hard to get. The idea behind this series as brought out by editor Thoralf Gilbrant is to give as in-depth a study aid as is available in the better scholarly works but set up in a way that a Bible student who doesn’t read Hebrew or Greek can use to full advantage. I personally think that is as ideal an approach to further Bible study as I have heard. The Bible is made up of words and as pastors, or Bible students, we must know exactly as possible what they mean. To know less is to shoot in the dark. I look forward to using this set the rest of my life. I’m going to rearrange a shelf so they are reachable from my desk. I don’t have any insight on the volumes covering the books of each testament as I don’t have them. I’d love to, but in that lightning rarely strikes in the same place twice, I doubt I will. In any event, you are reading from one grateful-to-the-Lord guy for what the Lord dropped in my life this week. For anyone who is either a follower of my blog or likes “Reagan Review” on Facebook, I appreciate it. For anyone who has or will do so today, I would like to send you a pdf file of a chart entitled “Money In The Gospels”. It takes every type of money mentioned in the Gospels and describes their value in modern day amounts. This can make things like Judas’ 30 pieces of silver or the talents in the Parable of the Talents more understandable. Alicia took my hand drawn chart and made it a sharp looking chart created on Publisher. Just email me or send a facebook message.Thanks again. 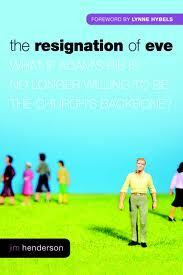 The Resignation of Eve by Jim Henderson is presented as tackling the “sad resignation…developing among dedicated Christian women who feel overworked and undervalued in the church.” I thought it might be the perfect counterpart to another book I recently read: Why Men Hate Going To Church. I felt the victim of bait and switch as I read this book.The real goal of this book is to promote women in the ministry. I must confess up front that women in the ministry is not a position that I find scripturally sound. He contends that many women are leaving church over this issue. Of course some women have left church if they could not have a key leadership/pastoral role in the church, but are we to believe that this is even in the top 5 reasons for women leaving church? What, then, is the reason men are leaving the church? Because leadership is open to them? He paints a dark picture of many more women leaving if they are not allowed to take any role they like.He makes his case with case studies of individual stories of women he interviewed. Each chapter is well written and you leave the chapter feeling you really know something about the woman be describes. Still, to prove a point, he uses only anecdotal evidence. Despite trying to say he used a good variety of women to present his case, the majority of Christian ladies I know could not be described by any example he used. The few conservative women he wrote about were not the best examples he could have used (I mean these ladies no disrespect). Even with them I felt thay were presented as naive, just not sophisticated enough to see the obvious truth that everything the Bible says about women not being pastors was culturally charged and without present bearing. Many thoughtful Bible students would disagree and to just state it as fact is weak. As the book went along, you got the feeling that he was promoting the idea that we must structure church to give people what they want to get them to stay. There was never a discussion of what the Bible actually said about how church should be done. He did mention a few inconsistencies among some churches that refuse women the office of a pastor. But that alone couldn’t carry his premise. The book should be advertised to the target audience of denominations that say they believe women are allowed to pastor but the numbers are out of kilter. Then the book could use arguments, as it did, that are used in the workplace. All in all, I cannot recommend this book. I received this book free from the publisher. I was not required to write a positive review. The opinions I have expressed are my own. I love Bible maps. It goes all the way back to the maps in the back of the Bible I received when I got saved all those years ago. No one would need as many as I have, unless , of course, you have a weakness for them as I do. Every Bible student should have one good one, and Sunday School teachers and pastors would do well to have two or three. What is the value in Bible atlases, you ask? The terrain of Bible lands is unusual to what is around us. You might have to go all the way across the United States to simulate the change experienced in 20 miles there. Plus you don’t know the towns there so if a Bible character took a journey from Jerusalem to Bethlehem it would be only 8 miles (like the Wise Men leaving Herod to see Jesus) while Nazareth to Bethlehem would be 80 or so miles depending the route taken (like Mary and Joseph traveled). Some routes were arduous journeys because of terrain while others would be easy walking. To go from farmland to desert, or from cool weather to hot, could in may places be done in a day on foot. A quick glance at a Bible Atlas might be the very thing that put the Bible story you read in the proper perspective. A good Bible Atlas will have quality pictures of various Bible places (a picture is definitely worth a thousand words in that case), topographical information, plenty of maps as there are so many stories in the Bible, and good graphics. My eye for graphics might be different than yours, so previewing the maps before you purchase is a good idea. Christian Bookstores usually have only a couple choices so going to Christianbook.com and searching the Bible atlases and viewing the excerpts available would be helpful. You will want to make sure that they follow conservative scholarship in the map information provided. Comparing a few atlases will reveal that some Bible sites are less certain than others and you might have to read the evidence and make your own judgment. The best Bible atlas for the pastor would be what is now called The Carta Bible Atlas, which for years was called The MacMillan Bible Atlas. I had the older edition for years, but the newer one contains some new helpful maps and I am glad to get it too. This atlas is far superior in the OT than the NT, but even the NT maps are helpful. It is written by Aharoni and Avi-Yonah, Jewish scholars who lived in the Bible lands. I doubt they were believers, but the OT was the heritage of their people and they put together the best. The graphics are not spectacular, but the number of maps for even lesser-known events make them always my first choice. (Link below for review). Since I first released this article, Emanuel Hausman of Carta wrote me (comments below) and said, “Please note that the 5th revised and expanded edition of The Carta Bible Atlas (2011; OT – Anson F. Rainey & NT – R. Steven Notley, a devout Christian). Incidentally Notley’s Chapters, Historical Geography of the Gospels &The Early Days of the Church in The Sacred Bridge have been rated “superb”. Also the 1st edition of Rasmussen’s NIV Atlas of The Bible, A Gold Medal Title, was created by Carta as was the earlier edition of the Standard Bible Atlas.” I appreciate his helpful information. I should also tell you about the most detailed atlas I have–The Sacred Bridge by Rainey and Notley. I’ll admit it’s a luxury, but it is the ultimate one available. The maps are small, but the text is detailed to almost every Bible event imaginable. It can be liberal in places, but if you want to find the archaeological site to match the Bible site in modern Israel, it is indispensable. Its comprehensiveness is unparalleled. It may be aimed more at scholars than pastors. There is a second edition out now that I have not seen. Just recently the publishers have offered In The Steps of The Master to offer that material to a wider audience. Carta’s New Century Handbook and Atlas of the Bible, published by Carta, is a less techical The Sacred Bridge and is outstanding. Pastors will love it too. Another great volume is the Zondervan Atlas of the Bible that was released as a new, improved edition in 2009. Formally, it was called the Zondervan NIV Atlas of the Bible. It is gorgeous and exceptional and I was glad to get it as a Christmas gift. For an economical, solid help it may well be one of the very best. There is a newly-released Zondervan’s Essential Atlas of the Bible that is a condensing of the larger work that I do not own, nor need since I have the fuller volume. I was glad to secure The Crossway ESV Bible Atlas by John Currid and published in 2010. This volume has many detailed, accurate maps and a great deal of texts and charts. It has the added bonus of being one of the most conservative in its conclusions and I believe I agree more with its choices for uncertain Bible sites than any other. This is a heavy hitter that appears to be vying to be pastors number one choice. You will like the vastly improved New Moody Atlas of the Bible by Barry Beitzel. It is so improved that I consider it a new volume unrelated to previous editions. Solid across the board, its greatest feature is the geographic section and the outstanding maps given there. Another contender is the Holman Bible Atlas (Link below). It is one of the top atlases for Bible students as well. Its maps are excellent and the text is engaging and the pictures of Bible sites as helpful as the maps. It has been a very popular atlas. I also recently reviewed the Rose Here and Now Bible Map Atlas (Link below). Rose Publishing has joined the big boys in the Bible Atlas world now. With its Carta maps and biographical approach, Bible students will find this a winner. The most recent major Bible atlas is The Discovery House Atlas by John Beck. Its author has spent an incredible amount of time in the Holy Land and it shows. I have enjoyed Biblica: The Bible Atlas. The maps are fine, but the key feature of this volume is the art work from all through the centuries. Weighing 10 lbs., this volume reminds one of Spurgeon describing a volume as big enough to be the author’s gravestone! Two good inexpensive choices are Bible Atlas & Companion by Barrett, Hudson, and Bolen and Holman Quick Source Bible Atlas With Charts and Biblical Reconstructions. The maps and graphics are really good in both. The former has really nice pictures as Todd Bolen is a well-known photographer. It covers many Bible events with excellent information and graphics. The latter has the added benefit of the first half of the book being on the unique geography of Israel. The maps are as good as some more expensive volumes. I highly recommend these two for pastors, Sunday school teachers, or any serious Bible student. You can also supplement your collection with older used volumes that are nicer than you might imagine. I have The Readers Digest Atlas of the Bible (maps good, text worthless), Atlas of the Bible by John Rogerson (average), “The Standard Bible Atlas” (a small student atlas using the Hammond maps that were the standard for many years), and The Moody Guide To Bible Lands by Tim Downey (old edition–there is a much improved edition just released and discussed below). I also have The New Illustrated Bible Atlas by Joseph Rhymer (decent), The Illustrated Atlas of the Bible Lands published by Warwick Press (below average), An Atlas of the Life of Christ by John Stirling (old, small, and very accurate), and New Bible Atlas by Wiseman, Bimson, et al (helpful). The older Atlas of The Biblical World by Baly and Tushingham (Graphics and pictures poor, information good) is worth having as is Bible Mapbook by Simon Jenkins (very good). A newer choice is The Kregel Bible Atlas by Tim Dowley (Concise, but good). Some of these can be found on used book sites for as little as $1. The last volume sells new for $15, but the others are out of print and I wouldn’t pay over $5 for any of them. A huge volume that could well supplement any collection is The Harper Collins Atlas of the Bible (one edition was called the Time Atlas of the Bible). It has cool maps that are sometimes reoriented with, for example, west at the top! If you are geographically challenged, this may be too much. I love some of their maps of Bible battles (hills with trees showing). Another is the Collegeville Atlas of the Bible. The graphics are really good as are the pictures, but the text lacks value. The Deluxe Then And Now Bible Maps published by Rose is a great concept and especially helpful were you to be planning a trip to the Holy Land, but I wish several of the maps of Israel were on a smaller scale. As mentioned above, incorporating these maps into the Rose Then And Now Bible Maps Atlas was a great idea. There are some specialty volumes out there like Battles Of The Bible: 1400 BC-AD 73 by Dougherty, Haskew, Jestice, and Rice. It is visually stunning and exciting to look at as battles played a big part of many Bible stories. Here are a few more, but only if you are a map junkie like me. The Holy Land Satellite Atlas Volumes 1 and 2 published by Rohr Productions.” These volumes are unique and give information that you can’t get anywhere else. When I studied for my solo trip to Israel and Jordan I used these volumes to help me transpose Bible Atlas information on modern road atlases. The pictures are extraordinary and include sites the other atlases never show, at least in up-to-date fashion because many of them are deep in the West Bank. I should mention, too, the Student Map Manual: Historical Geography of the Bible Lands. You will enjoy the Aerial Atlas of the Holy Land by John Bowker. It is in no way exhaustive, nor would I choose what he did to highlight in the same number of pages, but it is great for what it chooses to cover. I really enjoy its pictures and the maps are sufficient. It is a fun addition to the atlas section of your library. Carta has been publishing several specialty atlases well worth checking out. Check out some reviews I’ve done of these volumes here, here, and here. In addition, Carta has maps you use could profitably use while touring in Israel. Check out the Jerusalem Biblical Archaeology map. Now they have an excellent Israel Biblical Archaeology map as well. Before I close I should mention that there are a few very nice volumes that I do not yet have. Since I am a little compulsive/obsessive in this area, I’ll try to get them at some point. I have not yet seen the Tubingen Bible Atlas. It is a bilingual work that I have heard good things about. I would love to secure a few more specialty atlases on Bible history as well as some on the city of Jerusalem. I will update this post with each new acquisition. I’m likely one of the few people who thinks that an hour of bible atlas viewing is an hour well spent. Still, we can all profit from a Bible atlas in our Bible studies. Feed My Sheep: A Passionate Plea For Preaching published by Reformation Trust Publishing, which you can find at Ligonier.org, has 11 chapters by various authors calling us back to the prime importance of preaching. Albert Mohler first discusses the primacy of preaching citing history and Scripture (e.g. Col 1: 25-29) to build his case. He shows us that preaching is not one of a pastor’s important duties, but , in fact, it is the key one. We do live in an age where pastors are expected to do everything and some pastors prefer almost any administrative duty to the hard work of sermon preparation. Perhaps over time we become rather slick, but too superficial to do our people any good. I loved his analysis about “product envy” for preachers. Other professions can look at how many items sold or made but results in the task of preaching are not so easy to calculate. The lack of quantifiable results may derail us from expounding the Word of God which carries the help those we minister to really needs.James Boice tackles the “foolishness of preaching”. He argues that preaching is God’s wise way to show that the world’s wisdom is foolishness. He also speaks of how many Bible characters preached, and how preaching leads to conversions and church growth. Ultimately, this works because the Lord works through His Word.Derek Thomas writes on “Expository Preaching.” Really this is the type of preaching referred to in the whole book. Using the history of several great preachers, defining the terms of preaching carefully, he writes as an academician. His description of failed preaching types is really good. Joel Beeke writes on experimental preaching, or getting beyond explanation to application as all good preaching should. R.C. Sproul discusses teaching in preaching. Since we live in a generation that prefers light preaching this is a challenge to help our people learn the Word of God. R.C. Sproul Jr. has a brilliant chapter on “Preaching To The Mind”‘. 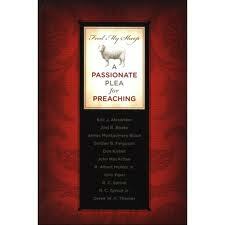 Sinclear Ferguson writes with good effect on “Preaching To The Heart.” His chapter is practical. Don Kistler gives us “Preaching With Authority”. He discusses how Jesus spoke with authority, an authority so obvious all noticed. He relates how Paul wrote about it, for example, Titus 2:15. He reminds us of what an awesome call we have in our call to preach. Eric Alexander writes on “Evangelistic Preaching”. Some might find it lacking. John Piper speaks on “Preaching To Suffering People.” Perhaps this is an example of how productive a use this call to dedicated preaching can provide. John MacArthur writes the closing chapter as a plea to take the contents of this book and go and do what a shepherd should do. The book is an encouragement. It runs against the tide of modern-day preaching and is what we need. You may have noticed that every writer tightly holds to reformed theology, and though I definitely do not, we must graciously admit that reformed writers are simply giving us the best writings on preaching today. This book is a clear example of that fact. I want to be the preacher the Lord wants me to be. Don’t you?